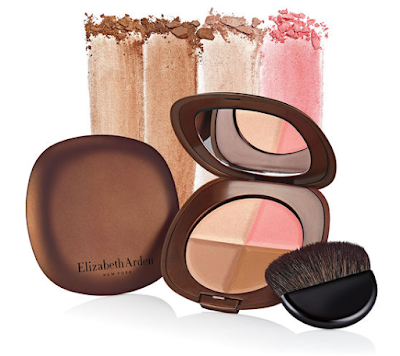 Welcome summer with the new Tropical Escape colour collection from Elizabeth Arden. This warm summery range is inspired by the vibrant hues of the tropics, hot sands, exotic flowers, and mesmerizing sunsets. Is the main product of the collection, is a four-in-one mirrored compact with highlighting, blush, contouring and bronzing powders. Designed to help you recreate a healthy, sun-kissed glow all year round, this bronzing quartet imparts a natural radiance while hydrating the skin for a soft, smooth glow. Each of the shades can be worn individually, to enhance your features, or blended together for a beautiful, bronzed effect. The Four Ever Bronze Compact is available in two colour harmonies: Medium and Deep. Are tinted lip oil that creates a pop of luscious colour that’s both nourishing and chic! The product pairs the hydrating benefits of an oil with the pigment of a gloss, protecting and rejuvenating the lips. Coconut oil soothes lips on contact, keeping them hydrated and soft, and avocado oil, rich in vitamin E, provides moisturizing and conditioning benefits along with antioxidant protection. The oil is available in six shades. Is a limited edition nourishing oil that imparts the skin with a subtle radiance. A luxurious blend of skin-loving oils, infused with the scent of vanilla and coconut, balances the skin and makes it hydrated and soft, while wrapping it in a veil of golden shimmer. The blend includes sunflower seed oil, jojoba and macadamia oils, meadowfoam seed oil, and antioxidant vitamin.